Dironet tablets - 6 tablets in blister. Outer package: carton Dironet suspension - 10 ml polymeric bottle with a syringe dispenser in carton. The broadest spectrum antihelmintic effect. Aromatic flavour in drug composition: fresh meat for dogs and salmon for cats. 1 tablet of Dironet tablets contains pyrantel pamoate - 150 mg, praziquantel - 50 mg and ivermectin - 0.06 mg (as active ingredients), as well as excipients. Dironet tablets are intended for dogs. 1 ml of Dironet suspension contains pyrantel pamoate - 15 mg, praziquantel - 5 mg and ivermectin - 0.006 mg (as active ingredients), as well as excipients. Dironet suspension is manufactured for cats (salmon flavour) and dogs (fresh meat flavour). The mechanism of Dironet action includes broad-spectrum nematodocidic and cestodocidic effect, activity related to roundworms and tapeworms parasitizing dogs and cats (including Toxocara canis, Т. cati, Toxascaris leonina, Uncinaria stenocephala, Ancylostoma caninum, Trichuris vulpis, Echinococcus granulosus, E. multilocularis, Diphyllobothrium latum, Dipylidium caninum, Multiceps multiceps, Taenia spp., as well as larval development phases (microfilaria) of Dirofilaria immitis and Dirofilaria repens. Mechanism of ivermectin action involves binding with glutamate-gated chloride channels located mainly in swallowing and somatic muscles. As a result, membrane permeability to chloride ions increases, neuromuscular impulse transmission is blocked leading to paralysis and death of a parasite. Mechanism of pyrantel pamoate action involves block of neuromuscular impulse transmission, damage of cellular membrane permeability and cholinesterase inhibition also causing paralysis and death of a parasite. Mechanism of praziquantel action is based on damage of glucose transport and microtubule function in cestodes, inhibition of fumarate reductase and ATP synthesis, increase in cellular membrane permeability and muscular innervation disorder. 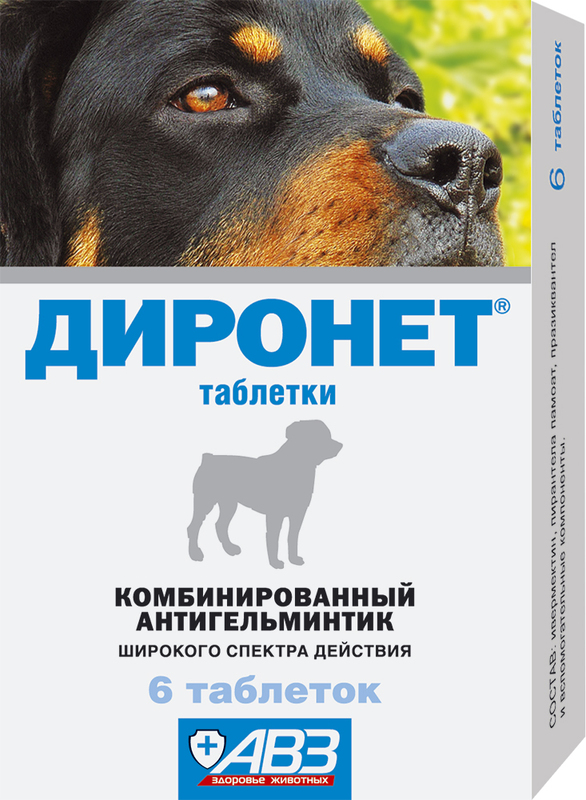 Prevention of dirofilariasis, as well as treatment and prevention of canine and feline nematodosis and cestodiasis. Do not use with piperazine derivatives, as well as in pregnant and lactating animals, puppies and kittens under 3 weeks old. Use in Collies, Shetland sheepdogs and Bobtails under attending veterinarian's control. Nematodosis and cestodiasis of gastrointestinal tract: individual oral administration in a single dose during a morning feeding (1 tablet per 10 kg of body weight or 1 ml of suspension per 1 kg of body weight). Deworming of animals weighting less than 0.5 kg: add 0.3 ml of boiled water to weighted dose of suspension immediately before oral administration, carefully shake and give it to animal. Previous starvation diet and cathartics administration are not necessary. Prevention: quarterly, in dose listed above, as well as before every immunization. To stop microfilaremia in infested animals administer the drug monthly in therapeutic dose. Prevention of canine dirofilariasis in vernal-estival-autumnal period: in a single dose before the beginning of mosquito flight (March or April), monthly during all the period since April till October and in a month after the end of mosquito flight (October or November) for the last time in the season. Store Dironet tablets and suspension in closed original package. Protect from light and moisture. Store separately from food and animal feeding at 0-25°С. Keep out of the reach of children and animals. Dironet suspension - 10 ml polymeric bottle with a syringe dispenser in carton.